Anglican priest Father Gilbert must draw on his skills as a former Scotland Yard detective when an apparent suicide and two hundred year-old murder are seen to be linked. A feud between two local families brings yet more murder, and reveals a history of violence and occult plotting. 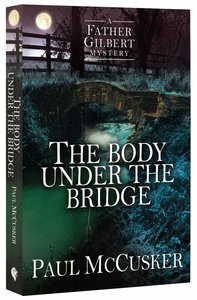 About "The Body Under the Bridge"
:A former Scotland Yard detective, Father Gilbert knows about death. But, now a priest of a modest Anglican church in the small town of Hailsham, he didn?t expect it to show up like this ? in the suicide of a man who threw himself off the church tower, and in the discovery of a two-hundred-year-old body beneath an ancient bridge. The deaths are linked. The mummified corpse under the bridge, a murder victim, reignites a centuries-old battle between two local families ? the Todds and the aristocratic Hayshams. Then both David Todd and Lord Haysham begin to act strangely. They are fearful for reasons they won?t explain. When Lord Haysham is murdered, David Todd is the prime suspect. But Todd is acting maniacal, claiming great forces of evil are at work. An entire history of violence and depravity begins to emerge ? interweaving the history of several local families with a secret occult society that engages in Black Masses. Has the Society emerged again? Paul McCusker is the creative content director for Focus on the Family. He has been a writer of fiction, nonfiction, and drama since 1979. His work includes over forty published novels, full-length plays, dramatic sketch collections, and song lyrics. For the Adventures in Odyssey series alone, he has written over 200 half-hour radio episodes, eighteen novels, and two screenplays for the best-selling animated videos. He has dramatized many classics for Focus on the Family Radio Theatre, including A Christmas Carol and Jan Karon's At Home in Mitford. He also wrote and directed the Peabody Awardwinning Bonhoeffer: The Cost of Freedom and created the highly acclaimed Father Gilbert Mysteries series. Paul lives in Colorado Springs, Colorado, with his wife, Elizabeth, and their two children.